US Steel's Homestead Works in Homestead, Pa., was shuttered in 1986 due to the severe downturn in the domestic steel industry. Remnants of the steel works remain on the land that is now home to The Waterfront shopping center. In 1940, 19,041 people lived in Homestead, but as a direct result of the loss of the mill employment in the 1980's, the population dwindled to 3,165 according to the 1980 census. 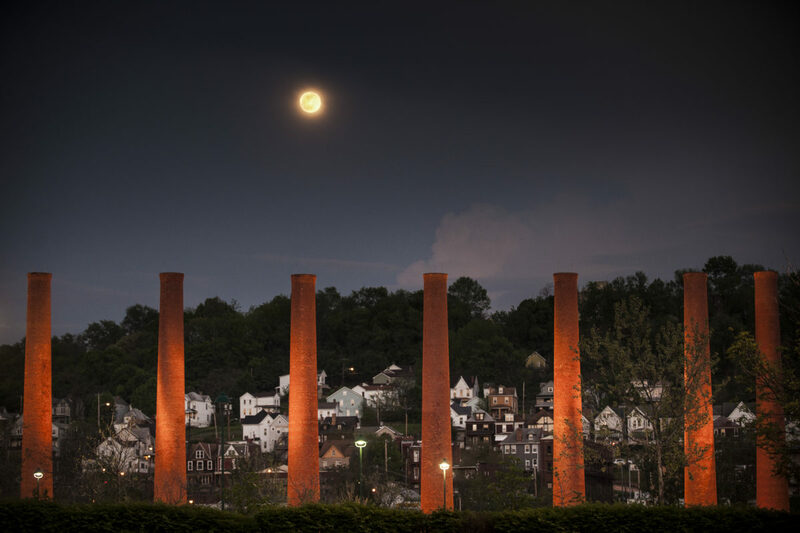 The Carrie Furnaces were built in 1881 as part of U.S. Steel's Homestead Works, a sprawling 400-acre complex that spanned both sides of the Monongahela river. They produced up to 1,250 tons of steel a day until 1978 when they were closed. 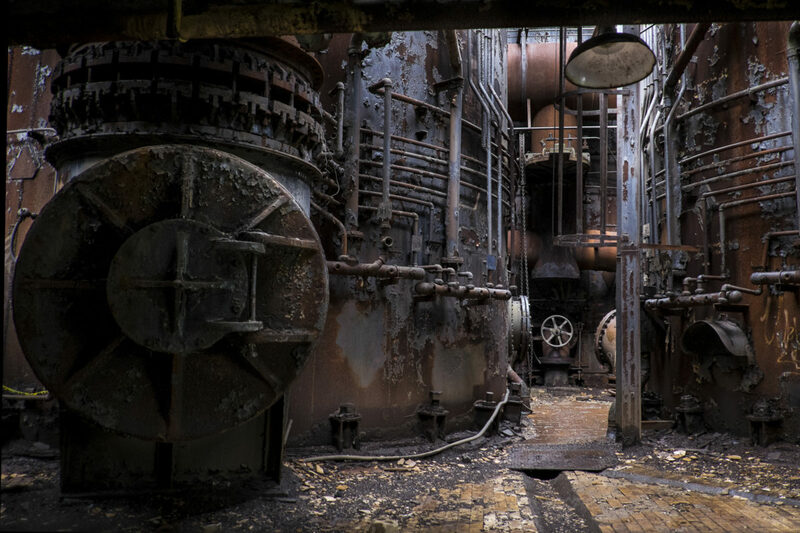 The furnaces were designated as a national historic landmark in 2006 and preservation efforts are underway. 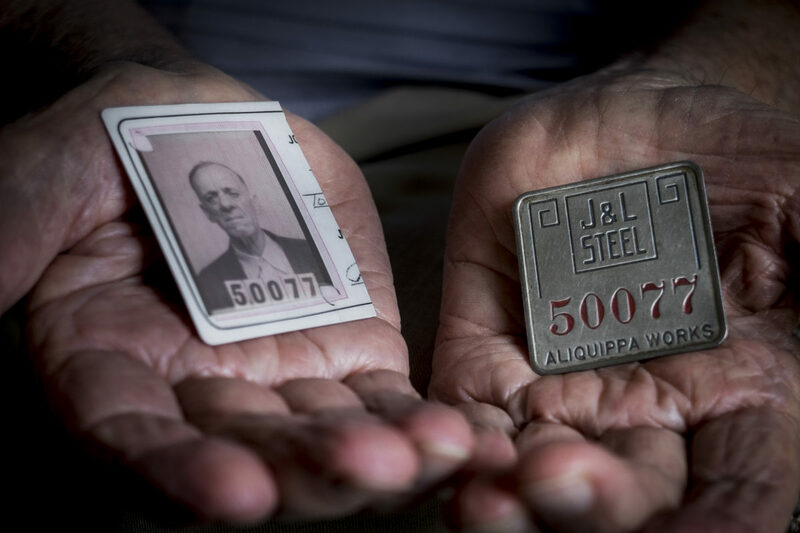 Pete Marovich, Sr., holds his father's Jones and Laughlin Steel Company ID card and badge on June 7, 2015 near Aliquippa, Pennsylvania, USA. An immigrant from Yugoslavia as a teenager, Tom Marovich worked in the J&L mill for 37 years. The company cut the ID card in half upon his retirement. The Aliquippa works, which once spanned 7 miles along the Ohio River, sustained a population of over 27,000 in the 1940's. With the mill gone since the early 1990's, the population has shrunk to around 9,200 by 2015 estimates. 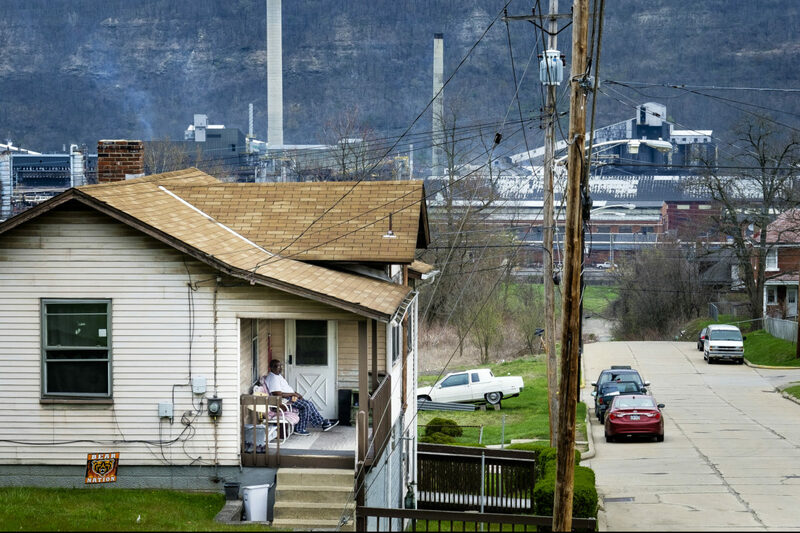 John Fields, 53, sits on the front porch of his family home with the Clairton Coke Works in the background on March 31, 2016. Clairton, Pennsylvania, USA, home to the world's largest coke production facility, was founded just after the turn of the 20th century when Crucible Steel Company acquired land along the west side of the Monongahela River 13 miles south of Pittsburgh. Coke, made from coal, is the fuel used in the steel making process. Struggling for 28 years and designated a distressed municipality by Pennsylvania's Department of Community Affairs, Clairton was finally removed from the distressed classification under the Financially Distressed Municipalities Act (Act 47) in 2015. Even though the town is making progress, its residents still do not have a grocery store. 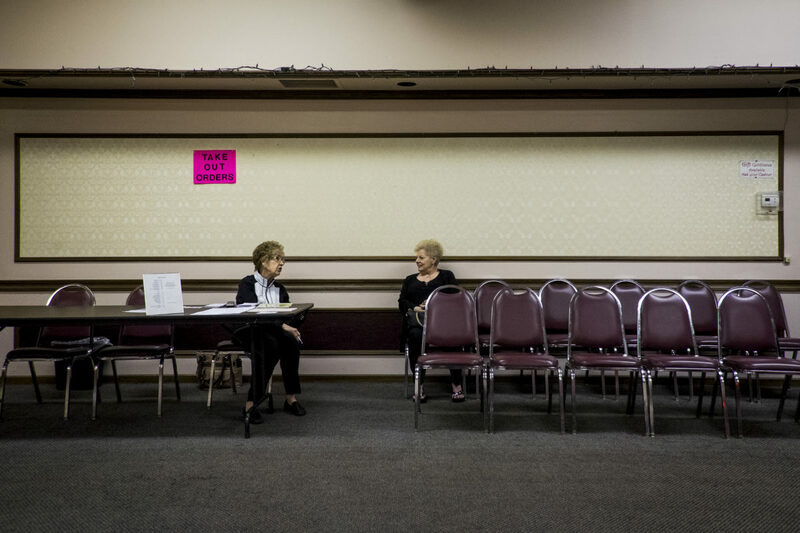 Two women chat as one waits for her take-out lunch order at the Aliquippa Croatian Center in Aliquippa, Pennsylvania, USA on June 5, 2015. All of the steel towns around Pittsburgh had social clubs for Serbians, Croatians, Ukrainians, Carpatho-Russians, Italians and countless others. Today most of these clubs are dying off due to a lack of interest of the younger generations. 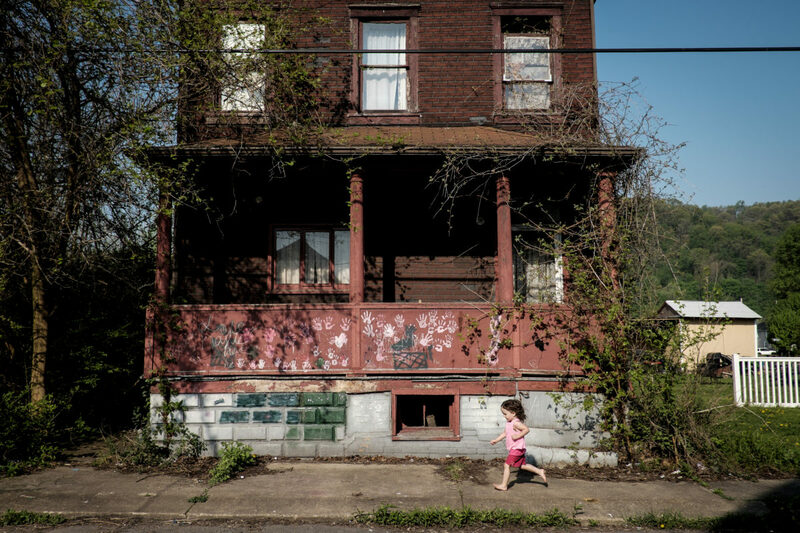 A young girl runs past an old J&L company home that is slated for demolition on May 8, 2015 in West Aliquippa, Pennsylvania, USA. As foreign-born workers flocked to western Pennsylvania at the turn of the 20th century to fill jobs at the Jones & Laughlin Steel mill in Aliquippa, the company built homes for the workers. Many of these homes are still standing today. 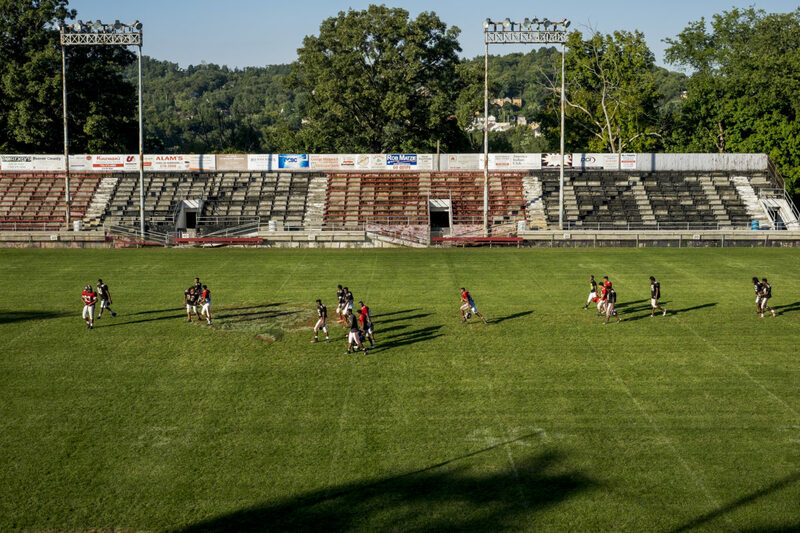 The Aliquippa High School football team walks across Carl A. Aschman Stadium following practice to prepare for their homecoming game on September 16, 2015 in Aliquippa, Pennsylvania, USA. Although the steel mill is gone and the town struggles economically, fans still come in droves and sit in rusting steel and wooden bleachers to watch their beloved school's football team play in a stadium that was built in 1937. The school has one of the smallest enrollments in the Western Pennsylvania Interscholastic Athletic League (WPIAL) with the class of 2013 having only 58 kids, including 28 boys. Pretty steep obstacles for a coach and team to overcome, but the team averaged 10 wins a year for the past 30 years. The team was the training ground to NFL greats like Mike Ditka, Sean Gilbert, and Ty Law, all of whom were Aliquippa graduates. 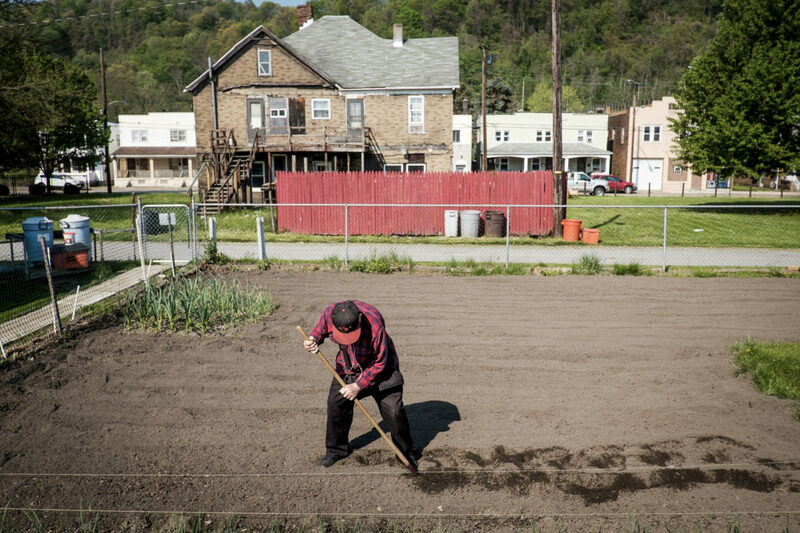 Frank Purrachio, 86, plants a row of vegetable in his backyard garden in West Aliquippa, Pennsylvania, USA on May 8, 2015. Purrachio, a retired millwright from the J&L Steel Works, has lived in West Aliquippa all of his life with the exception of a few years in the Marine Corps. 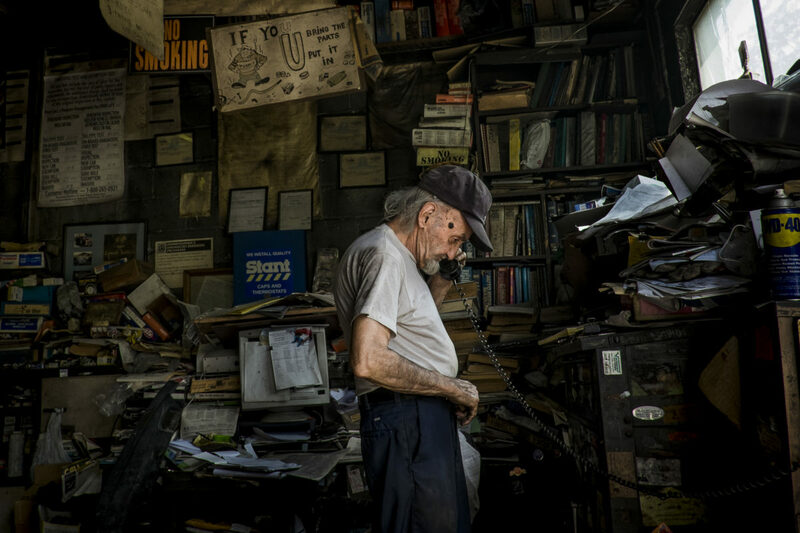 Angelo "Tubby" Galzarano, 79, speaks to a customer on the phone in his repair shop, Tubby's Auto Service, in West Aliquippa, Pennsylvania, USA on June 5, 2015. Galzarano has worked and lived in West Aliquippa his entire life. 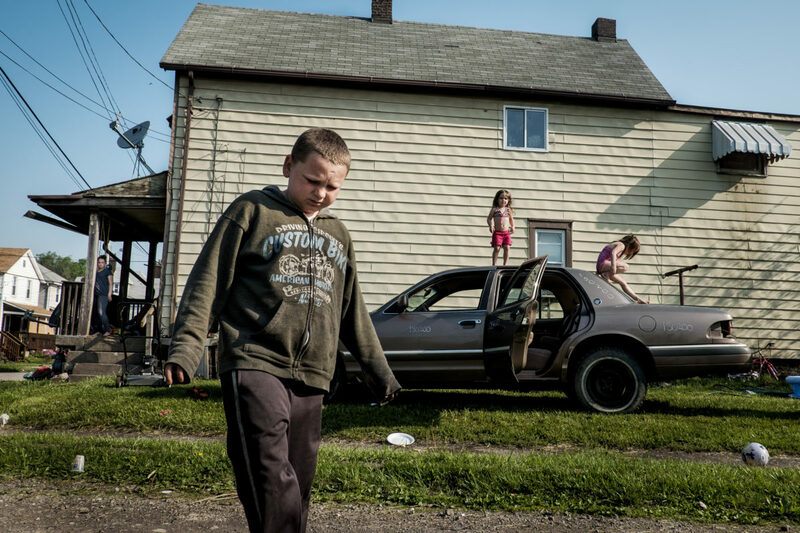 Children play on their dad's demolition derby car outside of their home in West Aliquippa, Pennsylvania, USA on May 8, 2015. Since 1987, the city has been designated as a distressed municipality under the state's Act 47, a law that created a recovery program that's helped some 29 municipalities in the state stay afloat. The city now has fewer residents now than the local steel mill had employees (14,000) in its heyday. The mill closed for good 20 years ago. With few good job opportunities available, children who grow up in the area may be faced with tough economic times when they are ready to join the workforce. A woman walks past the old Steel City Appliances store on one of the main streets in Clairton, Pennsylvania on April 26, 2016. About three-quarters of Clairton's main street is boarded up including the laundry, the grocery store, three out of five banks, the three cinemas, and most cafes and shops. When the Clairton Coke Works employed 5,000 workers and ran three shifts, Clairton had three movie theaters and four car dealerships. Now the plant employs 1,300 workers and residents must drive five miles out of town to buy food since there is no longer a grocery store in town. 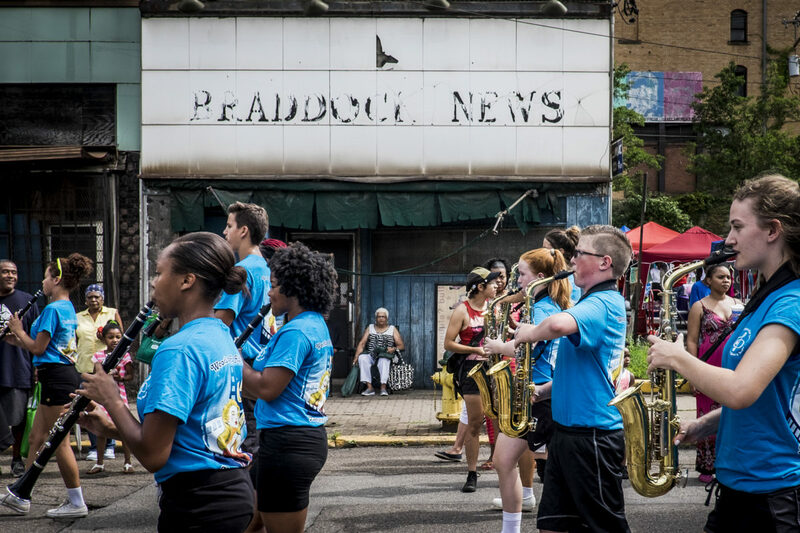 The marching band from nearby Woodland Hills High School passes in front of spectators near the former Braddock News building during the annual Community Day parade in Braddock, Pennsylvania, USA on August 13, 2016. Braddock High School closed in 1970. 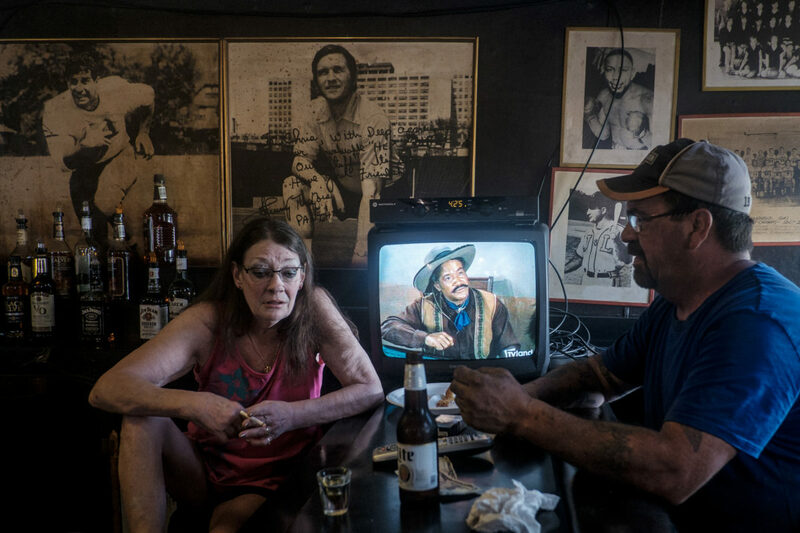 Bartender, Lisa Nicely, talks with West Aliquippa resident Chuck Forrester in Mahoney's West bar in West Aliquippa, Pennsylvania, USA on May 8, 2015. Mahoneys, in operation in West Aliquippa for 40 years, closed in 2016 when its owner became ill and unable to continue the business. Mahoney's was one of two bars that remained in a town that had more than 10 in its heyday. 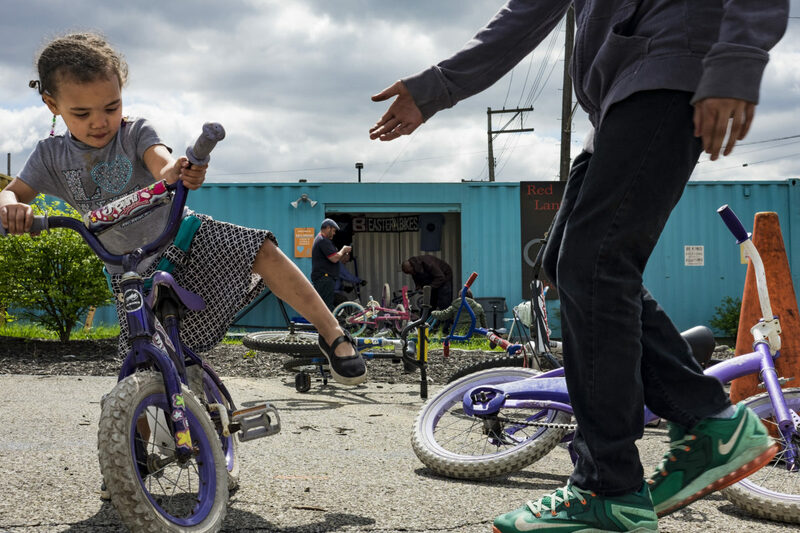 A young girl selects a bike at the Red Lantern Bike Shop in Braddock, Pennsylvania, USA on April 23, 2016. Brian Sink opened the Red Lantern Bike Shop in 2012 with the idea to provide bike repairs and free bikes for residents of Braddock. But after it became popular they lifted the restrictions on residence. Sink said he gave away about 1,100 bikes last year. Sink, known around town as "The Bike Guy," fixes donated bicycles and gives them away for free at his shop that is housed in a shipping container and part of Gisle Fetterman's Free Store. The Free Store, receives surplus and donated clothing, school supplies, food and toys that are redistributed to people in need. 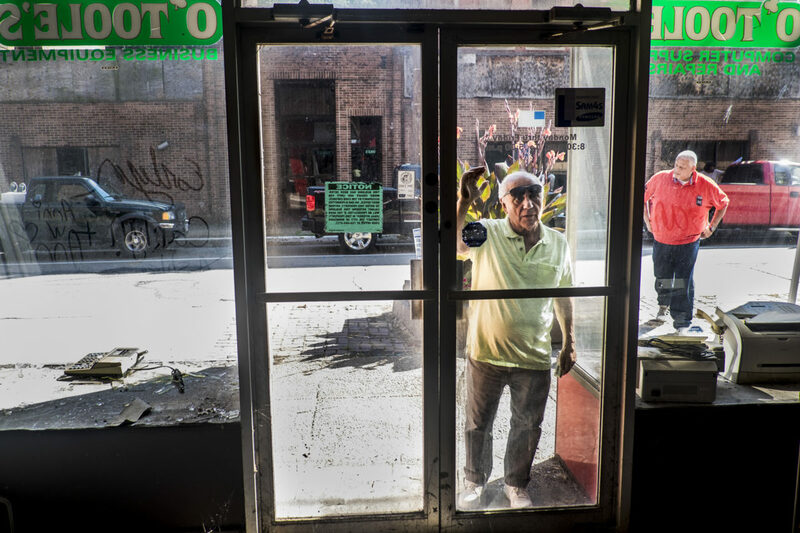 Mayor Lou Mavrakis looks inside the former O'Toole's business equipment store on Donner Ave. in Monessen, Pennsylvania, USA on August 12, 2016. 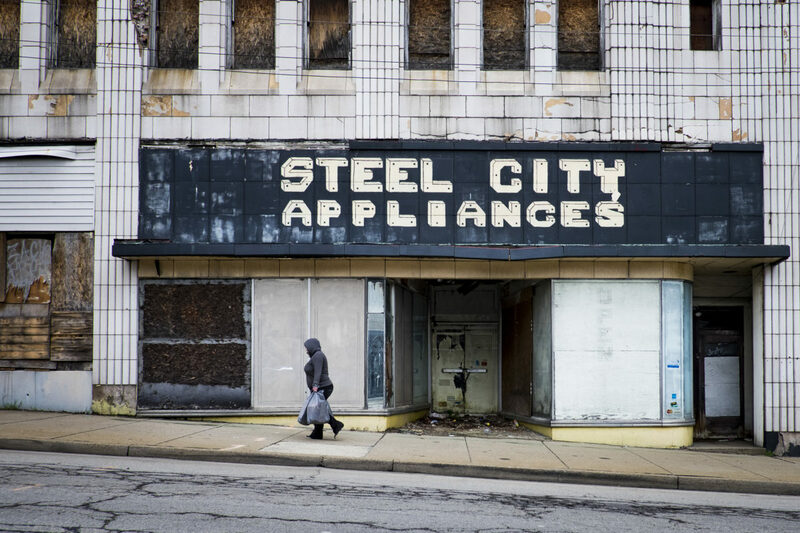 Monessen, a third-class city, faces the same problems as the other former steel towns — declining population and tax revenue after the mills shut down. The city's population has dropped to 7,600 from a high of 20,268 in 1930. 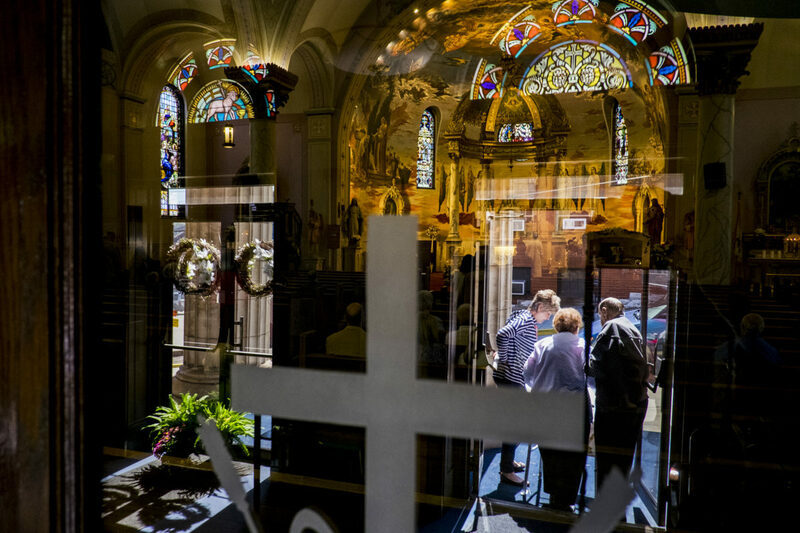 Parishioners leave following a Sunday service at Saints Peter and Paul Byzantine Catholic Church in Braddock, Pennsylvania, USA on September 24, 2016. In the early 1900's, although many immigrants from different European countries shared religions, they did not share a common language. Because of this hundreds of churches were built so that parishioners could attend services in a language they understood. Today, many of these church congregations are dwindling and many historic churches are falling into disrepair. 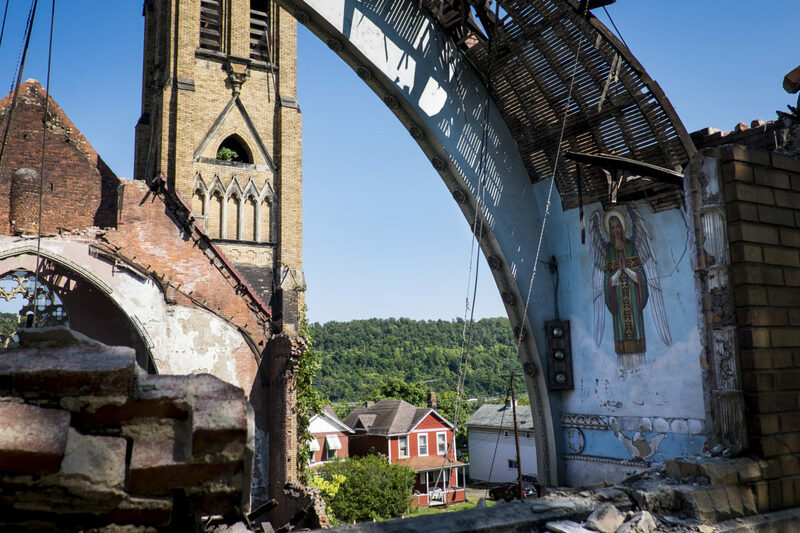 Demolition continues on the Holy Trinity Church in Duquesne, Pennsylvania, USA, on September 4, 2016. The church is being demolished after a storm caused the roof to collapse and make the rest of the structure unstable and unsafe. Holy Trinity Church is a gothic-revival style church dedicated in 1907 and served its congregation until the 1960Õs, when another sanctuary was built for the congregation. Duquesne was home to the Duquesne Works steel mill that was part of Carnegie Steel Corporation and later part of U.S. Steel. It was home to the largest blast furnace in the world, named the "Dorothy Six"
A retired steel worker gives a tour at his former work site at the Carrie Furnaces in Rankin, Pennsylvania, USA on April 30, 2016. 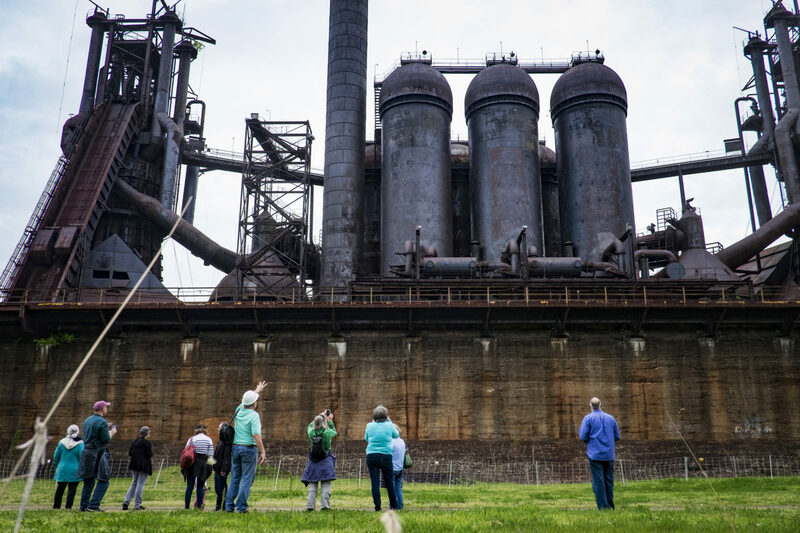 The Carrie Furnaces were built in 1881 as part of U.S. Steel's Homestead Works, a sprawling 400-acre complex that spanned both sides of the Monogahela river. They produced up to 1,250 tons of steel a day until 1978 when they were closed. They are an extremely rare example of pre-WWII ironmaking technology. The furnaces were designated as a national historic landmark in 2006 and preservation efforts are underway. 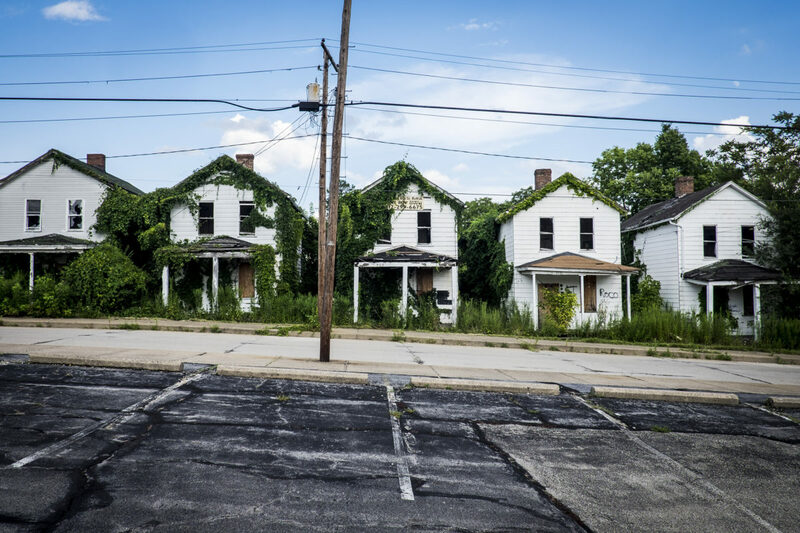 A row of homes are slated for demolition in Monessen, Pennsylvania, USA, when the town has money available to have the work done. Monessen, a third-class city, faces the same problems as the other former steel towns Ð declining population and tax revenue after the mills shut down. The city's population has dropped to 7,600 from a high of 20,268 in 1930. A young boy walks along the foggy streets of the McDonald Heights neighborhood of Aliquippa, Pennsylvania, USA on May 7, 2015. In 1955, when renowned photojournalist W. Eugene Smith was creating the images of Pittsburgh that would eventually become a book called Dream Street, Pittsburgh was the quintessential Rust Belt city. According to the 1950 census, Pittsburgh was home to more than 676,000 residents and was the 12th largest city in the country at the time. Steel was the city’s main industry. Aluminum, glass, petroleum and shipbuilding were also part of its economy. Although Pittsburgh was thriving, the industrial smoke was sometimes so thick that the streetlights came on during the day. The conditions earned the city the nickname “Smoky City.” In an effort to clean up the city’s reputation for being dirty and polluted, civic leaders initiated projects to transform the city, and Pittsburgh began describing itself as a city undergoing a “rebirth.” It replaced its smokestacks with glass skyscrapers and its slums with contemporary neighborhoods. Pittsburgh was recognized as a city in transition. Today, the U.S. Census Bureau estimates that the population of Pittsburgh is about 305,840, less than half of what it was during the city’s economic heyday. But once again, the Steel City is said to be experiencing a rebirth, with a rapidly growing economy largely based on healthcare, education, technology and banking. This may be true for Pittsburgh proper, but the scene looks a lot bleaker for the towns along the three iconic rivers that converge in the city. Ironically, the steel industry that brought Pittsburgh international fame existed almost entirely outside of the city limits, on the banks of the famous Allegheny, Monongahela and Ohio rivers. The only exception was a Jones and Laughlin complex on the Monongahela River. Other famous steel mills were located farther upstream in the towns of Homestead, Rankin, Braddock, Duquesne, McKeesport and Clairton. Downstream, along the Ohio River, other mills stood in Ambridge and Aliquippa. These suburban towns helped make Pittsburgh an industrial powerhouse, driven by an influx of foreign-born workers at the turn of the 20th century. Immigrants filled jobs in the mills, where steel was forged for the aircraft and battleships that helped win two world wars. But as you drive through these towns today, it’s clear they have been largely forgotten. Once bustling shopping corridors are all but empty. The company homes where mill workers raised their families are showing their age, and residents still reminisce about the “good old days” before the mills shuttered. 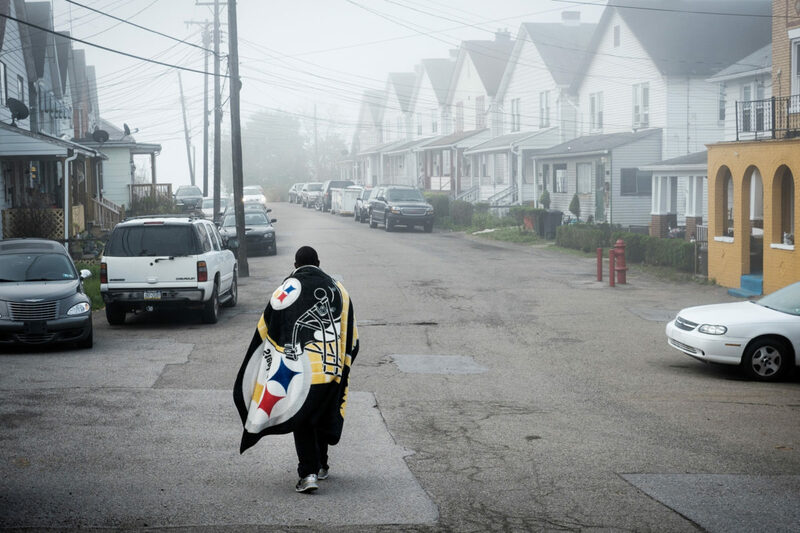 In recent years, the media has reported extensively about the rebirth of Pittsburgh, but it has focused little attention on the city’s suburbs and the plight of the people living there — except, perhaps, during election season. The immigrants who settled in these towns came with dreams of a better life. And for a while, it seemed as though those dreams would be realized in the streets of their new home. But many of the people living there today are doubting that those dreams still exist.